Permatite products are the high-performance choice in sheet metal fabrication, window and door manufacturing,architectural and building products, on- and off-highway vehicles, equipment, and heating, ventilation and air conditioning (HVAC). Known for their consistently high quality, Permatite sealants, tapes and sponges are formulated to exceed your specifications and requirements. Our rigorously tested products are certified to meet ASTM, UL, military, GSA, federal and other industry specifications. Permatite offers advanced selfleveling,acrylic, acrylic latex, butyl and fire-retardant sealants for diverse applications. 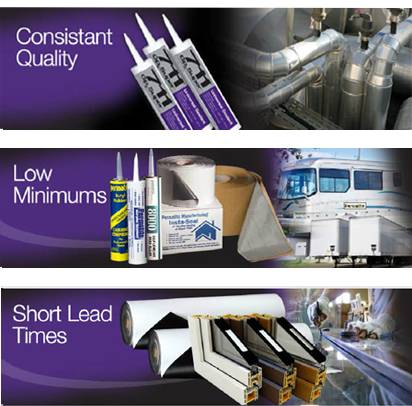 Engineered to meet specific requirements, our line includes general purpose, butyl, flange system and cork insulation tapes.